Kumar Aditya, an IT engineer based in Bangalore, invests without advice from a financial planner. 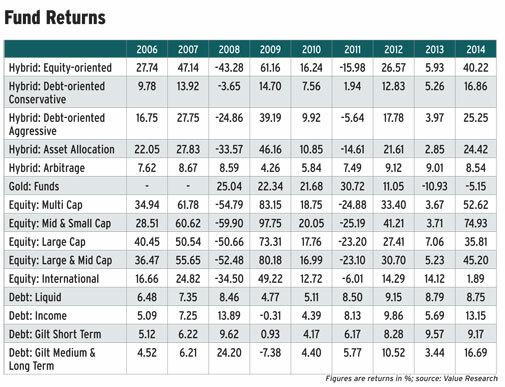 In 2009, a friend suggested that he invest in equity mutual funds. But having heard of the 2008 market crash, he decided to stick with fixed deposits and missed the bus in 2009 when markets surged. "I didn't know when to invest," he says. Many people find themselves in such a situation. The reason is that it is difficult to know which asset will do well in a given year. One way out of this problem is investing in asset allocation funds, which adjust the equity-debt allocation according to market conditions. "Asset allocation funds are designed to adjust the equity-debt allocation on the basis of a formula or change in the fund manager's perception of the environment," says Nilesh Rokadia, a Mumbai-based financial advisor. He says these are similar to hybrid funds but more actively managed in terms of asset allocation. "There are enough studies to suggest that more than 90% returns are determined by asset allocation and the rest by stock and bond picking skills," says Ajit Menon, executive vice president, DSP BlackRock (DSPBR) Mutual Fund. However, in some situations, these funds can be tax inefficient. Lakshmi Iyer, chief investment officer (debt) and Head of Products, Kotak Mahindra Asset Management Company, says, "In the current market, they are classified as debt funds on the tax front. So, one has to remain invested for at least three years." This means that most of these funds hold less than 65% funds in equities at present. 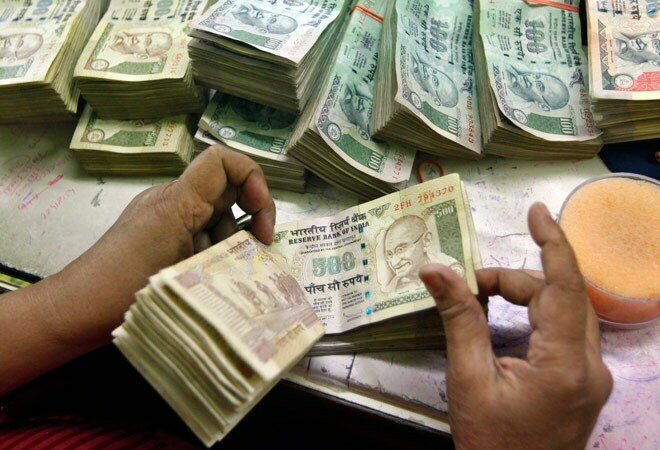 Short-term gains from debt funds are added to the income and taxed as per the investor's tax slab. Long-term gains (after three years) are taxed at 20% with indexation (adjusting the purchase price for inflation). This lowers capital gains and, hence, the tax burden. Not everyone considers tax inefficiency as a problem. DSPBR's Menon says, "Investments in such products should be made for five years or more. The idea is that investors need not time the market but keep investing for goals." "The problem with asset allocation funds is that there is too much variety. They have a short history and so judging them is difficult," says Rokadia. "It is difficult to judge a product based on only one bull or bear cycle. Its robustness should be measured over at least two full cycles," says Menon of DSPBR. There are 10 asset allocation funds in the market. 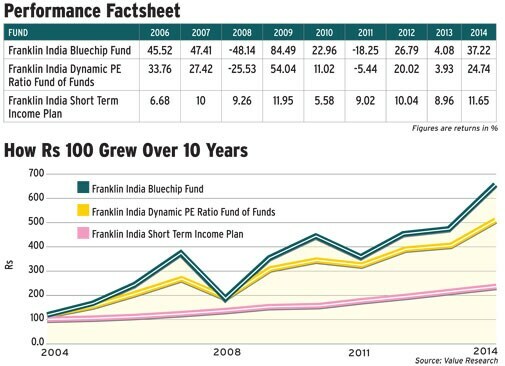 Let's look at the performance of Franklin India Dynamic PE fund, which is among the older funds with a 10-year history, and compare it with the asset management company's, or AMC's, flagship equity and fixed-income funds (Franklin India Bluechip and Franklin India Short Term Income Plan, respectively, where it also invests). The comparison shows that though Franklin India Dynamic PE fund has not risen as much as the AMC's equity fund, it protected the portfolio during 2008 and 2011 slumps (See Performance Factsheet). "Asset allocation decisions involve judgement calls," says Rohit Shah, founder & CEO, GettingYouRich.com. He says there are a number of factors such as risk profile, goals and market situation that are taken into account while deciding how much money should be invested in each asset. "Such unique aspects of an individual's requirement are not taken care of by just one asset allocation fund," he says. Birla Sun Life Asset Allocator Multi-Manager FoF Scheme: Invests in funds across AMCs, including those from Birla Sun Life AMC. Strategy: Asset allocation and choice of funds are decided by the investment team on the basis of four factors: (1) Price/earnings (P/E) ratios (2) The relationship between earnings yield (P/E inverted) and 10-year bond yields relative to historical averages (3) Fund flows (from foreign and domestic institutions) into equities and (4) The Reserve Bank of India's policy stance and yield curve. Ratio Fund of Funds: It's a fund-of-funds which primarily invests in schemes of Franklin Templeton based on specific PE bands. Strategy: Invests in Franklin India Bluechip Fund (Equity) and Franklin India Short Term Income Plan (Debt). If the invested amount accounts for more than 20% of either of the two funds, it invests in Franklin India Prima Plus (Equity) and Franklin India Income Opportunities Fund (Debt). HDFC Dynamic PE Ratio Fund of Funds: It is a fund of funds that HDFC inherited when it bought Morgan Stanley's India mutual fund business. Strategy: It follows the fund-offunds structure but the band used to decide the equity-debt asset allocation is based on the one-year forward PE ratio. The scheme's investment in any scheme does not exceed 20% net assets of that scheme. DSP BlackRock Dynamic Asset Allocation Fund: This is a fund of funds. Asset allocation is decided by comparing yield rates. Strategy: The factor used to determine asset allocation is the yield gap ratio. It is the ratio of dividend yield of equities and yield of a long-term government bond. It shows whether equities are overpriced or underpriced compared to bonds.